A unique ensemble of singers and musicians from different nationalities, all promoting the idea of peace through Christ, uplifting music and tranquil sound. John Boyd – is the foundation and heart of Peace Industry Music Group, a man of vision, passion, and purpose. He grew up singing and working in church choirs, and studied piano and voice privately in his youth. While in college, John studied with a church organist and began writing songs and arrangements. John founded and ran a Christian ministry in the heart of Detroit’s business sector in the 1990’s. After several years, he turned his focus to the fine arts. In 1997, John founded the Boys and Girls Choirs of Detroit, both replicas of the famed Boys Choir of Harlem. His choirs performed throughout Southeast Michigan and in the Detroit metropolitan area for six years. They opened for the Boys Choir of Harlem in concerts at the Opera House and Fox Theater in Detroit. John moved from Detroit in 2002, and soon formed the statewide Michigan Fine Arts Youth Choir, which performed in Grand Rapids and the Thumb region of Michigan. John took this choir on tour to Atlanta, and also to New York City, where they sang for Midori & Friends and at the Julliard School. In 2004, John formed the Perfect Blend Group – an ensemble of his children, ages 7-17 – to give his family an opportunity to be together and do their own thing. They performed around Detroit and in Southeast Michigan. They once traveled to New Orleans for the Jazz & Heritage Festival, where they charmed the socks off of everyone who heard them. John has been writing and arranging music for his choirs and family for over fifteen years. He has written several original spirituals and songs, and his arrangements are noted for their unusually beautiful harmonies. In 2007, John moved his family to North Bergen, NJ, to provide them with the opportunities available in and around New York City. 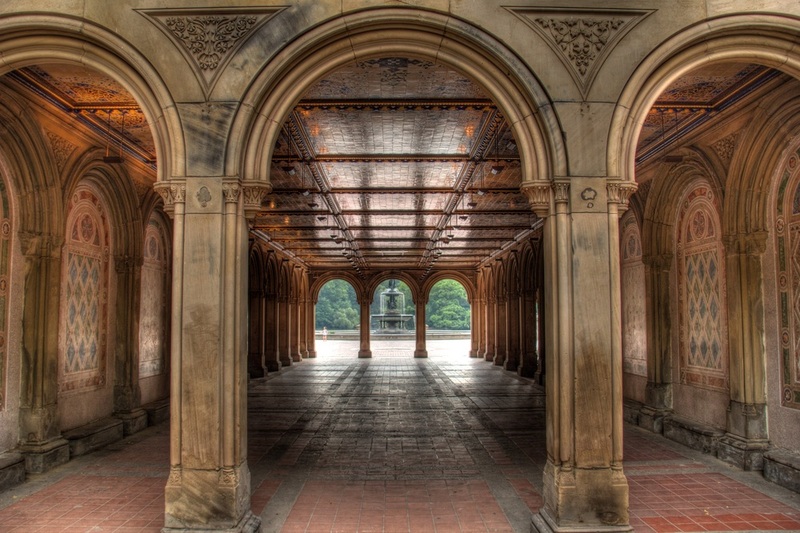 After a couple years of singing on subway platforms and on the steps of the Met Museum, they discovered the incredible acoustics of the Minton Tile Arcade near Bethesda Fountain in Central Park. Soon they became regulars at the spot, where they have been heard as “Boyd’s for Praise” by thousands of people from all over the world. Over the years, the Boyd family has been joined by several classical musicians and other singers. They recently reorganized as the Peace Industry Music Group. Abraham Boyd – 22, joined the Boy’s Choir of Detroit as an alto at age six. He joined his family’s ensemble when he was 12 and has been with them ever since. Abraham feels that working with his family is a wonderful experience, even though they get on each other’s nerves sometimes. He says, “You can’t buy the chemistry that you have with your family.” Performing has always been enjoyable for Abraham because of the warm reception his family has consistently received from audiences. He has enjoyed singing for people in Detroit, New Orleans, and New York City. Abraham plays the acoustic bass, having been introduced to the instrument by the band’s bassist, Vasyl Fomytskyi. Abraham is keen to explore the world of music theater and acting – he was recently cast in a production at the Times Square Church, The Cross and the Switchblade. Business is another arena that interests Abraham – he watches CNBC like it’s going out of style, and he is actively involved on the business side of the ensemble. Victory Boyd – 20, has been singing with her family since she was four years old. She sang in the Girls’ Choir of Detroit and the Michigan Fine Arts Choir. She joined her siblings in The Perfect Blend Group when it was formed in 2004. Victory enjoys the fact that her family can make a living singing, and that they are able to reach out to people all over the world to share the Gospel of Jesus Christ. There is no area of her life that has not been enriched by music. Victory has followed in her father’s footsteps and developed a gift for songwriting and arranging. Victory was introduced to the guitar by Vasyl, the band’s bassist. She has been playing guitar for 5 years and is largely self-taught. Victory loves going on long bike rides, especially in the fall, as they bring back memories of long bike rides in her home state of Michigan. Israel Boyd – 17, has been singing for nearly a decade. He loves singing with his family and really likes the music. Israel is a voracious reader, and has been known to devour an 800-page novel in five days. Israel would love to learn how to play the piano. Thalia Mosaia Boyd – 16, began singing with her family when she was six. She enjoys the camaraderie of performing with her family and feels that interacting with many people as a performer has taught her discipline and gratitude for her blessings. She loves singing at Bethesda early in the morning, when the environment is peaceful and calming. Thalia Mosaia enjoys abstract art. Harmony Boyd – 13, started singing with her family last year. She sings a lot during the summertime. She likes seeing a lot of people in the Park and enjoys the beautiful environment. Harmony wants to learn how to play the cello. Harmony is incredibly flexible and likes to show off a trick where she bends her arms behind her back and brings them up over her head. Michael Boyd – 10, has been singing with his family since July 2012. He thinks that singing in the park is a lot of fun. Michael wants to learn how to play the violin. He is an avid video game player and loves eating cake. His sister Harmony says he’s an excellent dancer. Shigemasa Nakano – (Shige) has been singing with Peace Industries since his first week in the United States. On his second day in the country, John found Shige street singing near the Port Authority Bus Terminal and invited him to sing with the ensemble. Shige comes from Japan, where he sang and played in his own rock band, Gunshy. The band’s debut album, Oceanic Delights shot to first place on Tower Record’s weekly chart in Japan. Shige graduated from Musashino Music University in 2003, and two years later found himself working for a Japanese record label as a singer and producer. In 2011, Shige bought a one-way ticket to New York City and began the life of his dreams, one of which is to sing with people all over the world. This he has been able to do with Peace Industry Music Group. Shige now studies with Mark Oswald and is making his debut with the Bronx Opera in January 2013. Vasyl Fomytsky hails from Kiev, Ukraine, where he began his career in 1973 playing electric bass in Kiev’s Music Hall Orchestra. He played double bass for 18 months in a Czeck military big band (similar to the Glenn Miller Band). Vasyl moved back to Kiev in 1981 and enjoyed a vast and varied career, playing acoustic bass in the Ukraine Radio National Symphony Orchestra, Ukraine National Folk Orchestra, National Symphony Orchestra, and the Antique Ensemble, a chamber orchestra performing classical music in Kiev’s cathedrals. In 1994, Vasyl moved to Egypt and played for 13 years in the Cairo Opera Orchestra. Vasyl relocated to New York City in 2007. He now plays in the String Orchestra of Brooklyn and has been playing with with the Peace Industry Music Group for over three years. Vasyl’s signature arrangement of “Ave Maria” for Peace Industry Music Group has become a crowd favorite. Meredith Rachel hails from Evanston, IL. Growing up, Meredith studied classical violin privately in Chicago, and earned a BA in Fine Art & Music at Hillsdale College. There she focused her studies on the violin works by Romantic and early 20thCentury composers, notably Wieniawski, Kreisler, Smetna, and Vaughn-Williams. Meredith has also immersed herself in the world of Irish traditional music, being self-taught for the past six years and studying tunes and fiddling techniches with NYC’s Sligo-style fiddler, Tony DeMarco. She can be heard at various Irish music sessions around the city, on stage with Irish rock band, A Band of Rogues, and on Sundays at the Porterhouse at Fraunces Tavern in lower Manhattan. Meredith teaches violin and fiddle to students of all ages. Meredith also earned an MFA from the New York Academy of Art and has an art studio in Bushwick, Brooklyn. Her award-winning equine-themed sculptures and drawings can be found in collections across the US. Meredith began playing with the Peace Industry Music Group in the summer of 2010. She has long been an advocate of fitting the violin into non-classical genres, and enjoys exploring the tonal possibilities of the violin in the original music performed by the ensemble. Julia Kost emigrated to the US from the Ukraine at the age of 17. She has been playing the cello for 30 years. Julia graduated from Central Washington University in 1998 with a Bachelor of Music in Cello Performance, and from Rice University in 2000 with a Master of Music in Cello Performance. While in university, Julia won honors and awards in numerous string competitions. She has performed in the Evergreen Music Festival Symphony, Tacoma Youth Symphony, and has been either Assistant Principal or Principal Cellist in the following ensembles: All-Northwest Orchestra, Vashon Island Chamber Orchestra, Central Washington University Symphony, Yakima Symphony Orchestra, Okanogan Valley Orchestra, Disney All-American Music Center Orchestra, Tanglewood Music Center Orchestra, Rice University Symphony and the New World Symphony. Julia freelanced in Miami for two years before moving to New York in 2008. Julia now records for a variety of artists and freelances as a chamber musician with many ensembles, including several rock-n-roll bands. Julia has been playing with the Peace Industry Music Group for 2 years. She enjoys playing solos with the group, picking up melodic ideas from the singers in a fashion that explores the range of the instrument, and communicating the feelings of the songs in a way that touches the hearts of those in the audience.